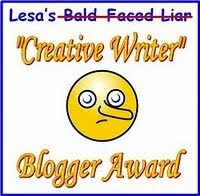 I've had the wonderful pleasure of being given a creative liar writer award by Clarissa Draper at Listen to the Voices. Thank you Clarissa for bestowing this honor upon me. For this award, I am asked to write seven stories. I've chosen to write six true stories and one lie. Can you pick out which one is the lie? 1.) I once drove my car into a lake while trying to impress a date. 2.) I've seen evidence of Bigfoot in the Olympic mountains of Washington State. 3.) One time, while serving in the military, I was in a flight of helicopters going to a field location when the helicopter in front of us disappeared in a fog bank. We later were told that the helicopter flew into the side of a mountain. I was then sent out to recover the crashed helicopter from a location that was so steep we had to rappel down the mountainside to get to it. 4.) I once lost my own son in New York City. We were all running to get on the train from Long Island into Manhattan. Everyone made the train except our nine year-old son. All we could do is watch in horror as the doors closed and the train pulled away from the station. 5.) In 1983 I made a trip to Berlin (at the time, East) Germany. We had a great time in the underground bars. In fact, I had such a good time that I awoke the next morning with a very unflattering tattoo located in an inappropriate place on my body. 6.) When I was a child, I loved to go down to the bay and fish. The biggest fish I ever caught was a shark, which I promptly drug through the dirt for about a mile to my house so I could place the stinking dirty dead fish into my parent's bathtub so I could show them when they got home from work. 7.) I was involved in a car chase, and managed to outrun the police (a long time ago) in a Volkswagen beetle. So, now I must nominate seven other "creative" writers with this award, and they must follow the directions as I have and post some stories of their own. 4. Tell up to six outrageous lies about yourself and one truth, or the other way around. 5. Nominate up to seven other "creative" writers for the award. 6. Link to those you nominate for the award. See if you can guess which one of these stories is a lie. I will post the truth behind the stories in a future post. No wonder you're a writer! I'm gonna say #5. Not because you haven't been to Berlin but because you probably haven't got the tattoo. My nomination must be spam affiliated. I never win anything. This award made my day! If I had to guess which is not true- I would pick loosing your son in NY. The second would be the tattoo, because I think you might be prone to do some uninhibited things under the influence(so shameful you won't even mention what the tattoo is)...anyone who knows me would know that me getting a tattoo would be my lie, so I kinda hate it that I can't use that one. Awesome, thank you so much! I'm going to do this in my blog tomorrow. Yay! !